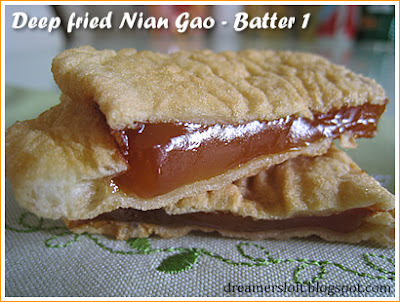 Lunar New Year may be over but it is just about the right time to enjoy some yummy niao gao, dip in flour and egg batter and deep fry to a crispy coat on the outside; and gooey, almost melt-in-the-mouth texture on the inside. Yum! I guess nian gao is something that is eaten only during Lunar New Year, same goes for Yusheng (both my fav for Lunar New Year goodies). Thus, I tend to over-indulge a little. Traditionally, the Chinese buy or make this sticky and sweet glutinous rice flour cake to symbolise growth and prosperity (I think). Fresh nian gao is soft and very sticky and people rarely eat it this way. Since young, I always look forward to after Lunar New Year when the nian gao turns hard and mum would make deep fried nian gao, sometimes sandwiched with slices of sweet potato and yam. 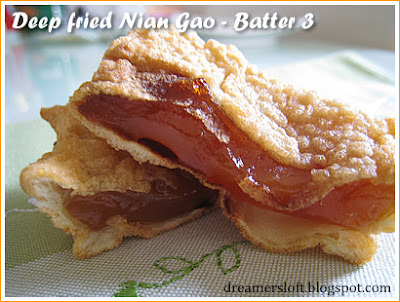 This year, I want to try my own ultimate deep fried nian gao! But how? Tried asking relatives, tasted nian gao by different households, searched online recipes posted by bloggers, flipped through magazines... different recipes yield different texture and results. Finally settled on 5 different batters. Deep fry on low fire until light golden brown on both sides. Batter 1 - adapted from recipe in Food and Travel magazine Feb 2008 issue. Verdict: Close to Batter 1 but more fragrant. Crust puffed a little when hot and more crispy but once again turned soft when cold. Verdict: Quite crispy crust when hot but still not fragrant enough. Soft when cold. Batter 4 - adapted from Club CSC website. Verdict: The original recipe uses self-raising flour and doesn't include egg and oil. During my first try, I didn't add the oil and egg. Crust was super crispy (a tad too hard) and lack fragrance. So I added egg and oil and it turned out better. Crust remained crispy even when cold. Verdict: The original recipe includes 1 cup water but after I added the egg to the flours, the batter was so thin that I added 1 more tbsp of corn flour (original only 1) and 1 more tbsp of rice flour (original only 2) and skipped the water altogether. Crust turned out light and crispy. Still crispy when cold but not as good as Batter 4. 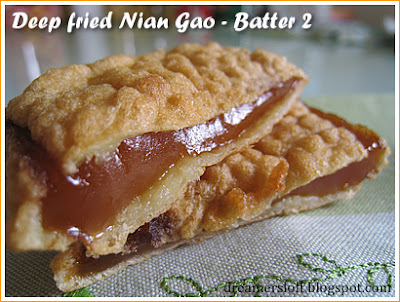 Both hubby and I prefer batter 4 since the crust remains crispy even when the nian gao turns cold. Batter 5 is ok as well, but not 1,2 and 3 as these turn soft and chewy after a while. 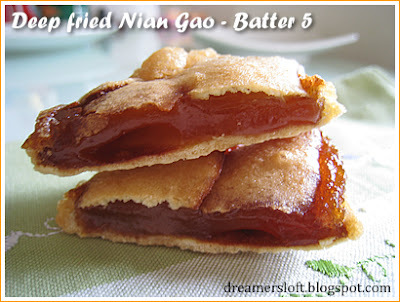 But I just can't seem to replicate the same nostalgic deep fried nian gao taste that I remember fondly as a child. Could be the ingredients or the amount of ingredient used. Anyway, I'm happy for now. Wow! This looks so good. Although I must confess that I've never tried one of these, but it sure looks very good! Wonderful photos by the way. Thanks for the recipe. Thank you for tagging me. I love your blog and I am excited to look at your recipes more! You have great photos! 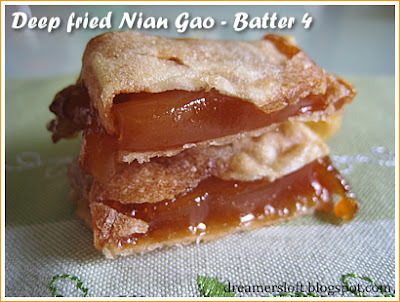 Thanks for visiting my blog :) You must try nian gao if you have the chance. It's actually possible to make nian gao from scratch at home, just tedious because of steaming process. kinda stumbled upon your blog..gosh the food looks great! i know it's 2 yrs late but can't help posting cos i love niangao too!! we do it by simply wrapping it with spring roll skin (1/4 of the big piece shld give it enough crisp) before frying it..its simple but gosh its fantaastic! haha! Cheers! Hello. In your batter number four, you have listed 45 g of 'top' flour - is that short for something else? What is top flour? Top flour is the finest quality of flour by Prima brand. You can find it at major supermarkets. It's good for baking cakes with refined textures like chiffon as it's very light and low in protein.